Android Distribution Updated for December 2015 – Marshmallow Hits 0.5%! Google updated its Android Distribution numbers today, detailing the updates inside of the Android ecosystem as a whole. For the month of December, while nothing crazy happened, Marshmallow did see a major jump from 0.3% to a solid 0.5%. That’s huge. Lollipop also saw a bit of a jump, going from 25.6% to 29.5%. 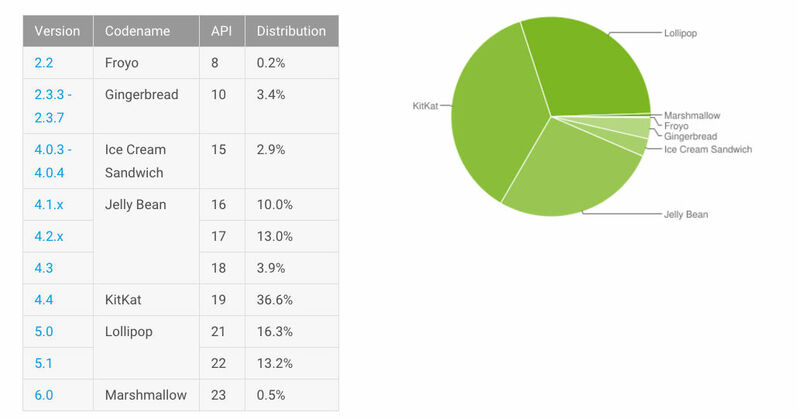 KitKat now sits at 36.6% (from 37.8%), Jelly Bean at 26.9% (from 29%), and Ice Cream Sandwich at 2.9% (from 3.3%). Gingerbread (3.4%) and Froyo (0.2%) did not see much fluctuation over November’s numbers.